We have been listening to “intolerance” a lot these days in India. This has become a point of debate on a regular basis I think for last couple of weeks. The consistent point is – India has become intolerant, especially off late when the Narendra Modi led BJP Govt has come in power. It’s obvious to have opinions, I too have my views on the same. Before, I scrutinize the subject further – I have been feeling that the intolerant India is more of a figment of few minds who are breaking their bread on this. Based on the above two definition I started scrutinizing current state of affairs. The killing of Mr Kalburgi in Karnataka falls under the definition of intolerance. The Dadri incident happened in UP recently also falls in that category (both the definitions). I had criticized the same earlier – Tolerance. These could be stray incidents, and also how can we make Centre Govt liable and responsible for state level incidents? Especially when these have happened in states where Govts are of opposition parties? In recent past I did not see any such incidents that were anything new. We are tolerant to many encroachments by Mandirs, Masjids and organizations affiliated to political parties. We are too insensitive to many things including terrorist attacks to killing of animals or people trying to save them. Surprisingly there was no hue and cry recently when a person (of one community) was killed by a group of people (from another community), who was trying to raise voice against cow slaughter in Karnataka (news link). The next question is – if it is intolerance; do the minority groups feeling insecurity across India? Perhaps they are feeling as they have been for last so many years. Well, the other apt question could be – how do you define minority? According to census of India 2011 (Population distribution), there were few religions namely; Hindu, Muslim, Christian, Sikh, Jain, Buddhist and 2 options no religion & others, effectively making eight divisions. So, if we divide 100% population by 8 divisions it comes out to be 12.5%. The definition of minority should accordingly be – religious group which has population <=12.5% is minority. According to this definition in 12 States & UTs Muslims are not minority (includes UP), in 8 Christians are not minority, Sikhs in 2 and Buddhists in 1. So, should we ask questions about how other groups (minority) are feeling in these states? Also, before anyone concludes that I’m a BJP sympathizer I had been India Against Corruption enthusiast and therefore for many AAP supporter. However, I have kept my abilities to analyze open and have no political affiliation. 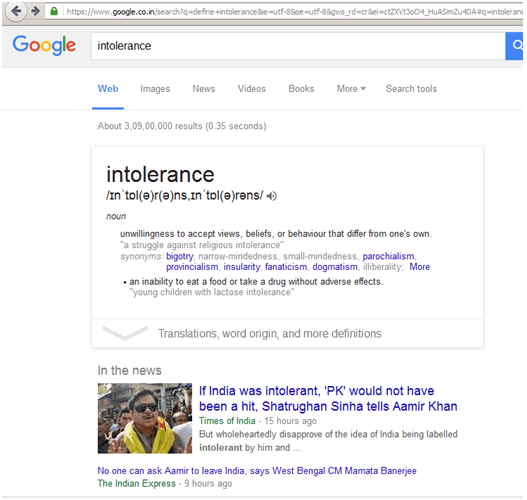 So, I in this post, I tried to define intolerance, made my opinion on the same. Also, since the definition of intolerance had “minority group” in it, I tried defining that too. 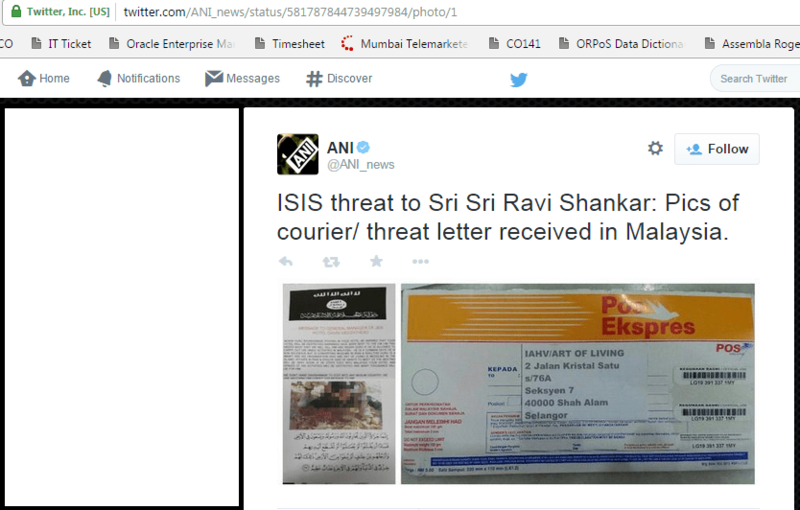 In the end I gave example of what could be termed as “intolerance”. Certainly that kind of thing has never happened in India since ages. Only remembrance of that historically is when Aurangzeb applied Jazya tax. Read details here – Jazya Wiki and Aurangzeb Jazya tax. Penalty of apostasy in Islam is Death! That is intolerance. I do not see any intolerance in India. Here is a link of discussion I am having with one of my childhood friends. We studied together, we were in Engineering together. My point is simple define intolerance first and than ask if India has changed in last so many years or last 2 years? My take – India has not become intolerant as discussed by many! Long time back I watched a movie Seven years in Tibet (book link Author – Heinrich Harrer). It was based on true story. In that movie after meeting the Dalai Lama Chinese representative makes a comment – “Religion is a poison” (Watch the video below). While watching the movie, I was shocked to hear this statement and was offended. Well, that time I did not start writing this blog, though I had reverence for the Buddha and the teachings of the Buddha. However, I knew this lessons even as a kid, when I had seen many religious violence, riots and subsequent curfews in my town (Dhar Madhya Pradesh). This lessons proves to be true historically and when we see what is happening in present day world. I intend to point at the Israel and Palestine conflict. I know when people will read this many will have their opinions. Here are two 5 min videos to give you different perspectives. Decision is yours to take sides. But I’ve realized – religion is poison. Religion is poison the way it’s preached & practiced now a days. One of my friends, Dhaval Thakar, suggested me to read a Huffington Post article before making my mind and opinion on the conflict – 7 Things to Consider Before Choosing Sides in the Middle East Conflict. A very relevant question is there in the post – why are we not questioning deaths happening in the attacks of ISIS and the killings during dictatorships of many rulers including – Saddam Hussein, Gaddafi et al. In fact there are conflicts all across the world – until we finish the weapons we have already made how can new weapons be sold? Until we finish the weapons we have already made how can new weapons be sold? The fanaticism we follow in the name of religion is really a poison. Now watch this movie directed by Vijay Raaz – “Kya dilli Kya Lahore” worth asking few questions. PS – at least I never heard the Buddha teaching killing, his one biggest lesson was compassion, besides meditation.